In some of my induction motors PTC thermistor is available for thermal protection which will be integrated to thermistor motor protection relay. There are three PTC thermistors connected in series in single motor. Maximum measuring temperature and voltage for PTC thermistor are 150 degree and 2.5Vdc. In that case can I use LT3SM00M Schneider thermistor motor protection relay for tripping the motor. Here maximum measuring voltage of my motor thermistor terminal is 2.5Vdc. So as per datasheet of LT3SM00M for less then 2.5V it will have normal operation and after 2.5V it will trip the circuit, but what does it mean by "Conforming to IEC 34-11-2, R=4000 ohm and V < 7.5." Please help me in this regard. Is there any consideration of R=4000 ohm and V < 7.5 for my circuit. From several sources, I have found that IEC 34-11-2 provides specifications to provide sensor and protective relay interchangeability. The relays are intended to trip based on resistance measurement, not voltage. The measurement voltage must not exceed 2.5 volts to avoid self heating of the thermistor. 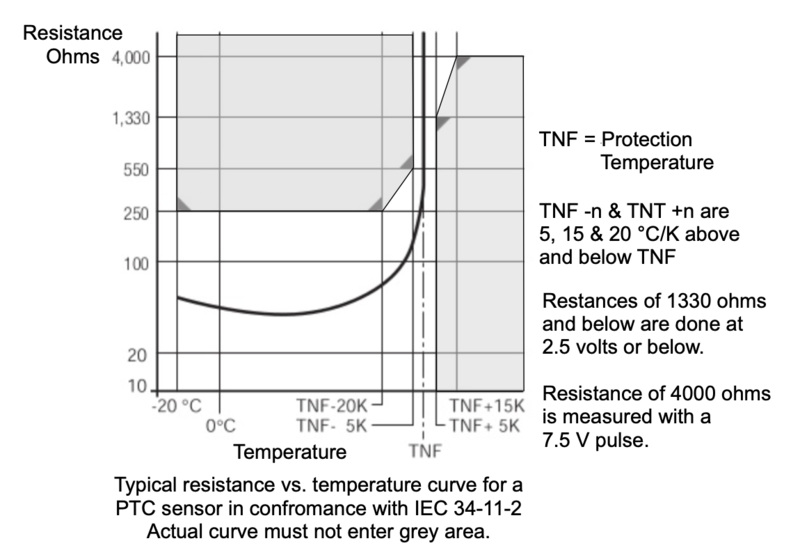 The diagram below shows the characteristics that the thermistor must meet to be in conformance with IEC 34-11-2. Normally three thermistors are connected in series. The sum of the resistances of the three thermistors plus the resistance of the external connecting wire must meet the requirements shown below to be compatible with a protective relay that is designed to work with a sensor that meets IEC 34-11-2. You have not stated if the motor supplier says the thermistors meet IEC 34-11-2 or what the resistance vs. temperature characteristics are. Not the answer you're looking for? Browse other questions tagged motor relay or ask your own question. Transistor based relay driver for DC motor is not working with 12V-8A DC motor?